This photo, originating from HMSO publications of the time, had been entitled “Spitfires can take it. Riddled fighter makes safe landing in Italy”. It is believed to be taken in 1944 and the aircraft is a Spitfire Mk. V, but regrettably the name of the pilot had not been recorded. Details of the actual event are also unknown. While the original caption seems to suggest some lucky escape in the air, a closer look at the photo seems to indicate a quite different event. The depicted Spitfire had been involved in the emergency wheels-up landing. This is indicated by the shattered propeller blades and the damage to the underside of the nose and wing root. Damage to all three blades suggests that the engine was running at the time of touch-down. The wooden Jablo propeller was another useful invention which was a fruit of operational experience. Introduced on Spitfire Mk. V, and adopted universally for Mk. IX ans subsequent variants, it presented a big advantage over metal propellers in case of a forced landing. The wooden blades shattered on first contact with the ground, thereby reducing forces imposed on the propeller shaft and the engine. This significantly reduced the risk for engine damage which was inherent with earlier all-metal propellers. Italy 1943. Riddled with nearly 80 holes, rudder control almost severed, a Spitfire of the RAAF was belly landed by the pilot, Warrant Officer Herbert Holten, a twenty four year old Australian from Melbourne, after a trip over the Sangro River Area. On a reconnaissance flight, Holten ran into heavy anti-aircraft fire. A shell went through the perspex of the cockpit, lumps of Flak made holes almost severing the rudder controls near the tail, a panel near the tail was blown away, another broken wide open. One of Holten’s oxygen bottles was burnt and the hydraulic system put out of action so that when Holten had steered his Spitfire back over 50 miles to his base, he was unable to lower the undercarriage. He however, made a magnificent belly landing and stepped from his plane unhurt. 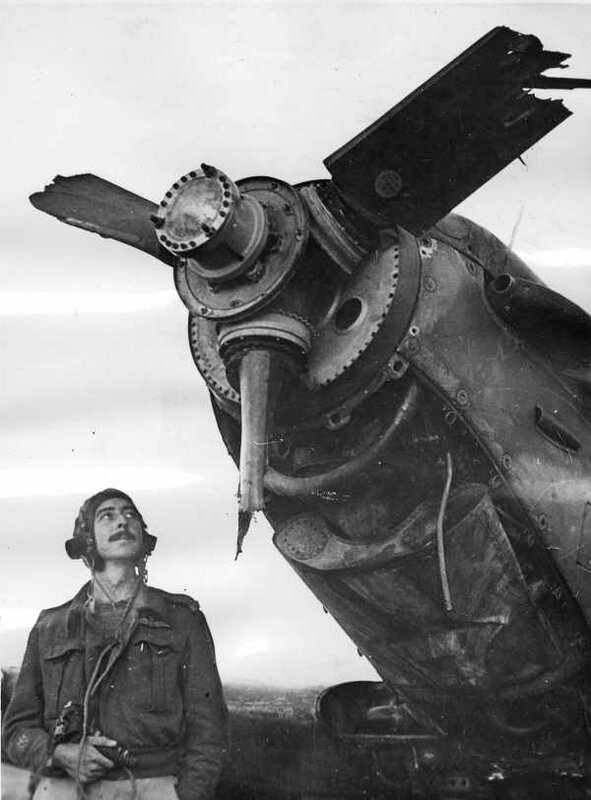 He is shown here looking at his airscrew blades which were broken in the landing. Sicily, Italy. c. July 1943. Warrant Officer Herbert Holten of Melbourne, Vic, who succeeded in belly-landing his Supermarine Spitfire fighter aircraft after it had been severely damaged during a reconnaissance mission over the Sangro River battle area. He is with his damaged Spitfire which was riddled with nearly eighty holes. 401509, Holten, Herbert Edgar, Flight Lieutenant. 451 Squadron RAAF. Date of Birth 7 January 1919. Date of Enlistment 28 February 1941. Date of Discharge 19 June 1946. Thanks for your comments which as I understand are factual and correct. Warrant Officer Herbert Holten was my Father and died in Cape Town South Africa in July 1993. Since my Father’s death, I have visited Melbourne and met my Father’s elder brother Leslie Holten who has since passed on about three years ago. Les was an Air Vice Marshall for the RAAF. I have other official photographs if you are interested. Let me know. I also have my Dad’s service record. Not a good copy but I got it from his brother. In addition to the above please note that Herbert Holton as pictured served with 451 Squadron RAAF in 1945 according to 451 Sqn Personal Occurrence Reports and ORB following transfer from C.G.S. Interestingly reference: http://cas.awm.gov.au/item/MED1568 the tail bears the markings of 601 Squadron RAF which Holten may have served with at the time since he barely appears in the 451 RAAF Sqn ORB. Unfortunately the National Archives of Australia does not have his RAAF Service Record yet coincidentally holds the Service Record of a virtually identical Herbert Holten V39200 whom is only differentiated by the year of birth. I have not examined this record so can not comment further except to say I am inclined to believe they are the same person and that the change of birth date may be worth looking into the reason why. So to find out further information of the incident 601 Squadron RAF’s ORB is likely to be the best source for details. Another possability, enlarging the photo, I can see what looks like red shoulder tabs…the tunic and khakis..this looks like a South African Air Force member?? The incident may have occurred with 40 SQN SAAF in Risano, near Udine Northern Italy when the units Spitfires were lined up to try and blow heavy dust off the runway, as no sweepers were available. Not having their tails weighted down, one of them went up on it’s nose. There is a picture of the Spitfire having just upended, with people running for cover, in the book “South AfricanAir Force at War” by authors Louw and Bouwer.